The rapidly growing interest into wearable electronics is attracting the attention of innovative fashion designer, technologists, artists and the educational sector who create wearable electronic design concepts of astonishing sophistication. 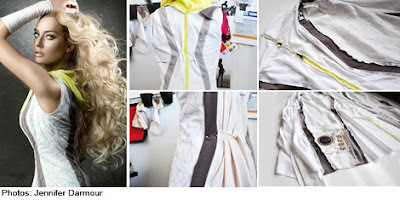 An example of the creative power of wearable technologies comes from Jennifer Darmour over at Electricfoxy, a Weblog dedicated to technology enriched clothing, a fix member in my daily search for news around wearable electronic. Jennifer’s latest design is called ‘PING – a social networking garment‘ with the aim to connect, to blend our social networking activity with our clothing, to connect our physical presents with our online identity. Beside the use of eTextile technologies like conductive threads, textile sensors and LilyPad components she uses the PING concept design to completely integrate the technology into a garment rather than simply attaching it to clothing, providing a new aesthetic of form and behavior. PING allows status updates on social networks like Facebook, Twitter and others. A gesture like lifting the hood and putting it back down can be communicated to Facebook. The Facebook application allows to customize messages corresponding to different garment interactions. 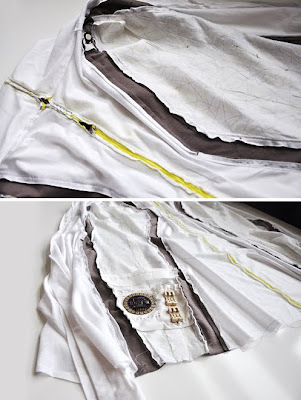 But PING is not only a one-way interactive garment as the Facebook friends or Twitter followers can send you through the garment tactile messages like a subtle ‘tapping’ feeling on the shoulder via the PING garment. As much thinking Jennifer did for the technology concept and technology development she spend also much time to demonstrate how beautiful, how appealing Social Networking Fashion can look with a gorgeous design she developed based on a variety of drafts, tests and design iterations to strike the right balance between aesthetics, functionality and technology integration. The result is astonishing in every aspect but most striking is her approach of integrating our habit of giving status updates to our followers and friends into our clothing which basically acts as our second skin, doing what we are doing all day long. Weaving social activities into clothing and accessories, adding different sensors to detect environmental variables like temperature, light intensity or yes – pollution our clothing can automatically tweet: I am almost suffocating or I am enjoying a beautiful, sunny day. One of the best technology enhanced fashion design, conceptual and style wise we have seen.